Home/Blog/ Marketing, Strategy, Video/Make a Promo Video to Promote Your Business! Make a Promo Video to Promote Your Business! Videos convert better than text. Marketers have known this for years! If you want to promote your business and get more sales and higher brand awareness, then video is the best option you have. And no, we’re not just saying that. Here at Yum Yum Videos, we’ve seen first-hand how video content has taken over the internet – because people prefer to watch a video rather than to read any kind of text! Take promo videos, for example. These kinds of videos are the best way to promote any kind of product or service: they explain any kind of complex information and turn it into something fun, dynamic and memorable. These videos are proven to boost audience engagement and have the highest ROI in the market, so they make great investments. But these are not their only advantages, so let’s take a look! Why does your business need a Promo Video? Online, people’s attention spans are getting shorter by the minute. Let’s face it – people live busy lives! And what they need is the kind of content that gives them the largest amount of information in the shortest amount of time. This kind of video does exactly that. They capture your audience’s attention… which is what you need and what you’ll be losing if you rely solely on text or complicated explanations. Promotional videos tell your audience exactly what they need to know about your product or service, and they leave them wanting to know more. After they take a look at your video, they’ll be hooked – and that’s a purchase in progress. Because of the nature of its content – a narrative that’s simple and engaging, and information that’s easy to understand – this is a kind of video that will bring high results no matter which platform you use it on. Marketers call this kind of video“multi-platform” because you could use it in your social media accounts, your YouTube platform and your website with the same kind of positive results from your audience. This is great, because it means that you get to reach different audiences, no matter where they are! Usually, your followers on social media are not the same people that could find you on a search on YouTube, for example. One tip, though! If you’re going multi-platform, make sure you don’t forget YouTube. It’s not only specialized in video, but it’s the second largest search engine online. Never underestimate the power of having a video that ranks high on YouTube. In websites where both video and text are available on the same page, 72% of people prefer to watch video to learn about a product or service. 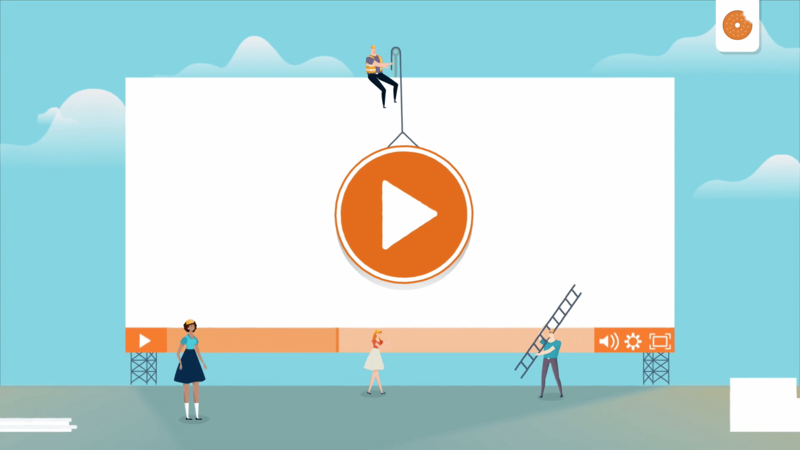 In general, visitors read about 20% of a text online, so they get the rest of their information from other sources – infographics, gifs, images… but specially video. People want information in the simplest and quickest way possible – why would they spend fifteen minutes reading an article when they can get the same amount of information in a video that’s just 90-seconds long? Video content is the present and the future of marketing, and promo videos are necessary if the goal is to attract more conversions and sales. There are lots of videos out there, and sadly, not all of them work – you can’t expect that a video that looks unprofessional converts the same as a high-quality video, specially created for a specific kind of audience. So, in order to create a video that successfully converts, you need to keep some things in mind! Remember what we said before about people’s short attention spans? Your audience is busy, and they need answers. ASAP. Well, that’s exactly the reason why your audience won’t stay and watch a 12-minute-long video. Ain’t nobody got time for that! When video length increases, your audience’s attention decreases. This means less engagement, and no conversions or sales whatsoever. And if you think you need to have a long video, because the information you need to communicate is way too complex or has too many important details, think twice. There’s nothing that can’t be explained in two minutes or less! The important thing is to decide what’s essential for your viewers to know in this stage of the purchase process, and to write it down in a script. Keep this in mind: a script of 160 words will make a video that’s about 60 seconds long. Our recommendation? Promotional videos should be anywhere from 60 seconds to 90 seconds long. More than that, it’s too much! That is the golden rule of video content. 2. Make it really yours – Customize your video. Would you pay attention to a promotional video that doesn’t communicate the brand that they’re trying to sell for? Yeah, we didn’t think so either. Branded content is important. Including your brand’s logo and its official colors, for example, is essential in order to give credibility to your product – there’s a serious brand backing it up! But it doesn’t end there. You need to customize your video at every level. That includes knowing who your audience is and creating content that is targeted specifically towards them. Know what their doubts and questions are, and answer them in your video, as this will make them feel like you were speaking to them directly. Create characters that behave and look like your buyer personas, and make sure that your video is narrated by voice actors that are native to your target audience’s location! Every single detail is important. Your video needs to be unmistakably yours. In a world with so many kinds of content, and 400 hours of video being uploaded every second, what kind of video do you think your audience will stop and watch? A generic one that’s not interesting and not very good? Or the high-quality one, strategically placed, that engages them and keeps them wanting to know more about the product? Professionalism is important. Promotional videos are the ones that will introduce your product to your audience, so why would you want your product to be associated with poor-quality content? Working with a professional explainer video company will help you achieve all of your marketing goals. We know that sometimes, this kind of service might be somewhat expensive, but trust us – every penny spent on professional video content will be a penny well spent. And as we mentioned before, video has a really high ROI rate, so you’ll see the results really quickly. How do you choose the correct company to help you with this? Start with looking at their portfolio, and see if they’ve worked with companies similar to yours, or very important ones. That’s proof of their professionalism! Also, look at their style – whether they make animated promo videos or regular ones, if you can picture your brand being portrayed in their style, then you’ve found yourself a winner! Remember, a great production company should have a team composed of professional writers, illustrators, animators, voice actors, camera-people, etc. Making a video is hard work, but it’s worth it! 4. Never forget video SEO! Do you know how to rank your videos online? There are many ways you can rank your video high on searches, but it’s not an easy task. It requires a lot of expertise! Use your target keywords in your tags and your video’s description. For your video’s title you should go for a nice longtail keyword, instead. Also, keep your titles concise (under 66 characters!) and update them over time to keep them relevant. Also, your video thumbnail is really important. It’s the very first thing your audience will see of your video, and in this case, they will be judging a book by their cover! Take your time to create an impressive thumbnail, one that will catch your audience’s attention. When used correctly, promo videos are extremely powerful – which other marketing tool will explain your audience what your product or service does in such a fun and engaging way? If you need to take just one thing out of this article it’s this: Make it memorable. Find yourself a professional video production team that will sum up your brand’s spirit and communicate it in a great video that catches your audience’s attention! High-quality promotional videos will boost your sales. So, are you ready to start creating?